When you go BYOB, you put a lot of thought into the last "B." Bringing just the right wine to match the cuisine can make or break your meal. But maybe that's all backward. Introducing (K)new, a clever little BYOB where you can host your own dinner parties, whether it's for 10 people or just two—and where the food is there to match your wine, now open. 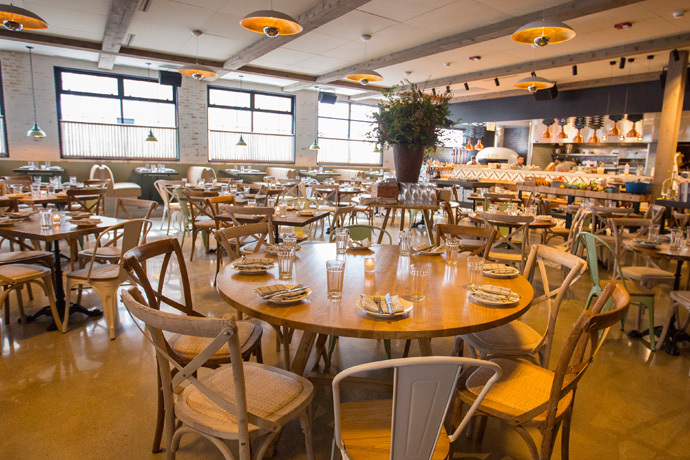 From the people behind Think, who left Bucktown last month for the greener pastures (and greener rents) of Logan Square, (K)new is decked out in the kind of simple, fresh-flower-on-every-table elegance that feels right this time of the year. For the regular menu, they've expanded the menu beyond Italy's borders, which means entrees like peppercorn-encrusted buffalo filet and lobster-and-shrimp pasta. But you'll be dropping by to feast at (K)new's 10-person chef's table. Located next to the kitchen, you can call ahead and talk with the chef to design a prix-fixe menu to suit whatever random bottles of Opus One you happen to have lying around. But for more intimate parties, you and a date can stake out a deuce, uncork some bubbly, and get to know each other over bread slathered with the sun-dried tomato and black-truffle butter while waiting for appetizers. If you can't decide between a "potato nest" (imagine a hash brown stacked with smoked salmon and horseradish crème fresh and black caviar) and lobster-stuffed Belgian endive, choose the appetizer tasting menu with a little taste of everything. Dinner—yes, there are apps for that.